Invite us to make a presentation at your school. All it takes is your invitation. We do the rest. Let us know you want us by emailing George Taylor, taylorgeorge1974@hotmail.com. Thanks. Counter military recruiters are legally allowed the same access to students as military recruiters, according to a 1986 Ninth Circuit Court ruling. Basically, the Ninth Circuit ruling stated that the question of military service (whether voluntary or compulsory) is a controversial political issue, and if a school establishes a forum for one side to present its views on the issue, it must give opponents equal access to the forum. • having counter military recruiters/peace activists be present whenever there are military recruiter present. have equal access to each other, as required by law, schools document and regulate recruiter visits. Some counselors will only allow recruiters at career/job fairs. Some counselors require students to make appointments with all recruiters, others have military recruiters and military counter recruiters sitting at tables outside lunchrooms once a month or once a semester. 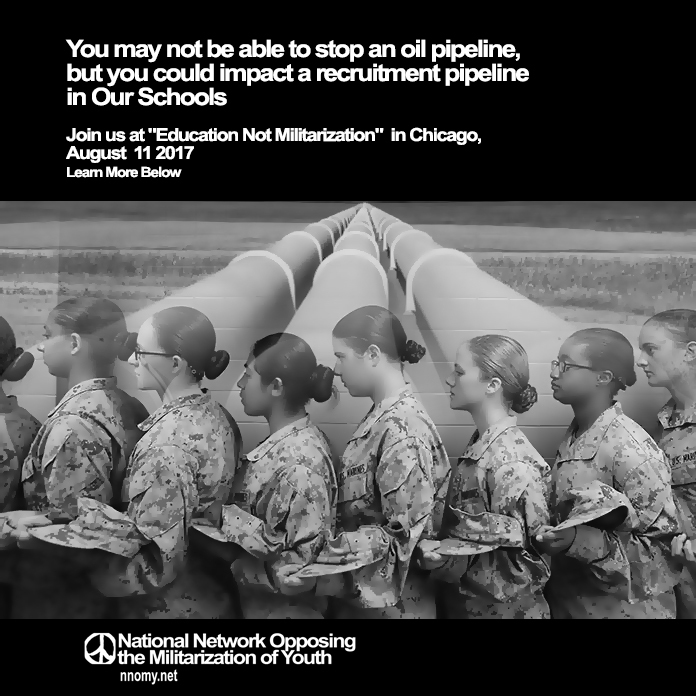 The National Network Opposing the Militarization of Youth will be participating in the 2017 Veterans For Peace National Convention in Chicago August 11th, 2017. Located at the beautiful and historic Palmer House Hotel, veterans and allies will gather to discuss “Education Not Militarization”. Registration begins on Wednesday, August 9th and ends on August 13th with a benefit concert by Jackson Browne. The week will be filled with amazing workshops, discussions, community and music. Donald Trump’s budget slashes social programs while inflating an already massive military budget, meaning that for many people in already underserved and underemployed communities, the military will be the closest thing to a welfare state they have. Today we bring you a conversation with Rory Fanning, a veteran and conscientious objector, and author of the book Worth Fighting For: An Army Ranger’s Journey Out of the Military and Across America. His work centers on opposing US militarism at home. He is also the coauthor, with Craig Hodges, of the new book Long Shot: The Triumphs and Struggles of an NBA Freedom Fighter. He lives in Chicago, which has become ground zero for military recruiting in the country, and often speaks at high schools there. “There are more kids signed up in Chicago JROTC and NJROTC than any other school district in the country; ten thousand kids: 50 percent Latino and 45 percent Black,” he told me. We spoke about opposing Trump’s military buildup, the roles that veterans and athletes can play in movements for change, and the long tradition of imperialism in the US. Sarah Jaffe: We will circle back, certainly, to talk about military recruiting, but because we are in the wake of Donald Trump’s first quasi-budget (and it has a lot of cuts to social programs in order to put all of this money into the military), I wanted to talk to you about the role the military plays in this right-wing nationalist political buildup and how people can resist that. 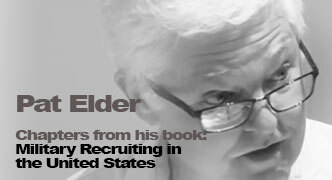 Delving into the underbelly of the US military, longtime antiwar activist Pat Elder reveals how military recruiters are assisted by the Department of Education, the film industry, the video game industry and mainstream media in order to fuel never-ending war — using the country’s most vulnerable young people as fodder. Get the book Military Recruiting in the United States by donating to Truthout now! Military recruiting is the beast that feeds the US military empire that spans the globe. It is unacceptable that many US schools allow military recruiters extensive access to young people who will become fodder for the Pentagon’s acts of war around the world, Pat Elder argues in this interview with Truthout. Pat Elder: Our military, like Rome’s, secures a dying empire while accelerating its demise. The behemoth US military is a cancer on the national body politic. It has led to financial ruin while contributing to the destruction of our cherished constitutional separation of powers. We’ve become a violent people, addicted to war. America is witnessing the “grave implications” of the “economic, political and even spiritual” influence of the military-industrial complex President Eisenhower warned us about. A single F-35 fighter jet costs more than the budget of a medium-sized city’s school system and the US is building 2,500 of them while the schools crumble. Parents of high schoolers need to know that the Pentagon consciously conspires to abridge student privacy (as a means of enriching the recruiter’s contact data), misleads the public and school administrators, and even risks public health (see the chapter on lead residue from shooting ranges) in order to obtain sufficient numbers of new recruits. The National Network Opposing the Militarization of Youth (NNOMY) is supported by individual contributions and a grant by the Craigslist Charitable Fund – 2016 Except where otherwise noted, content on this site is licensed under a Creative Commons Attribution 3.0 License. The VFP National Office has a page with more information. Check it out. 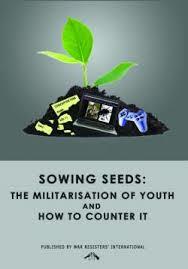 Another good resource to find out more on this issue is here.